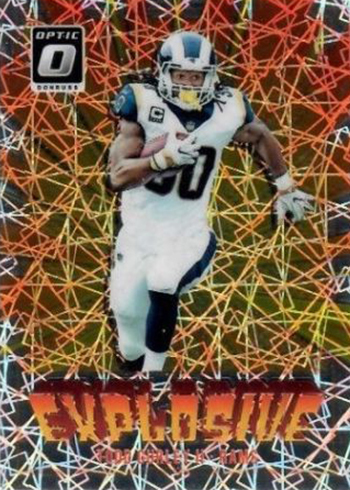 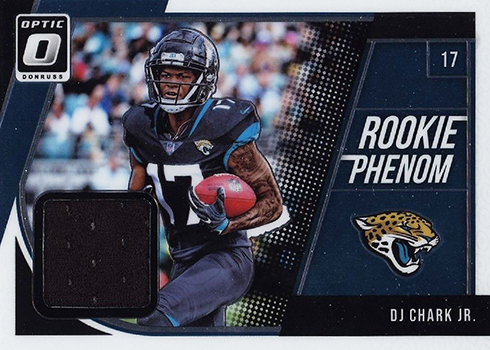 Jump to the 2018 Donruss Optic Football checklist and team set lists. 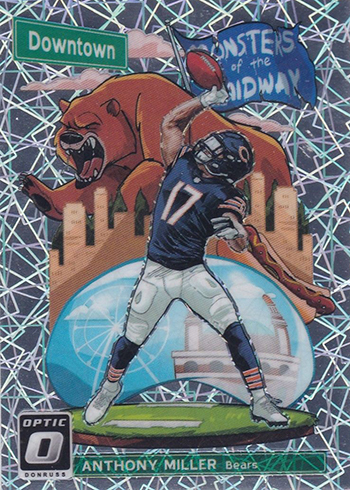 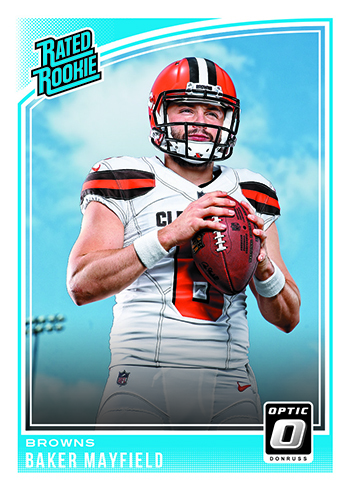 For those looking for a little (or a lot) of shine, 2018 Donruss Optic Football takes the year’s main Donruss release and gives it a chromium makeover. 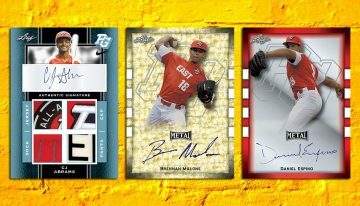 As usual, Optic brings with it a fair bit of variety in the form of autographs, insert themes, parallels and more. 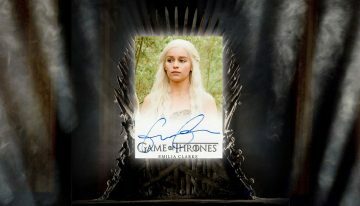 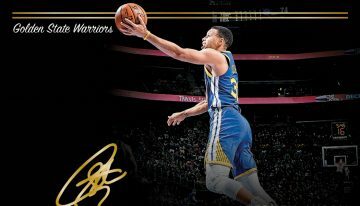 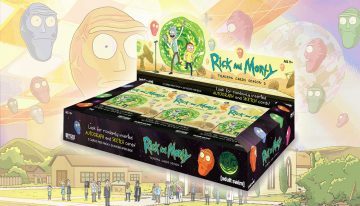 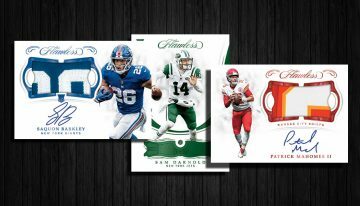 Each hobby box, which comes with 20 packs, has one signed card, four inserts and ten parallels. 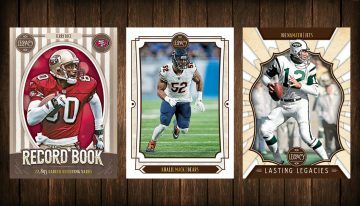 Packs also average out to have either a Rated Rookie or rookie subset card. 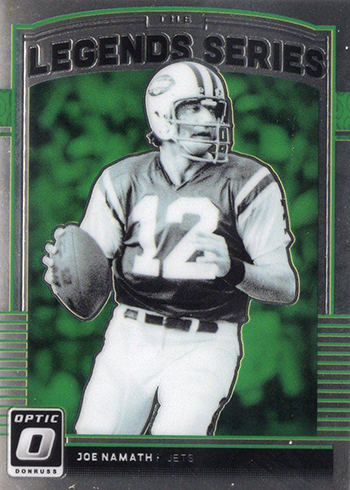 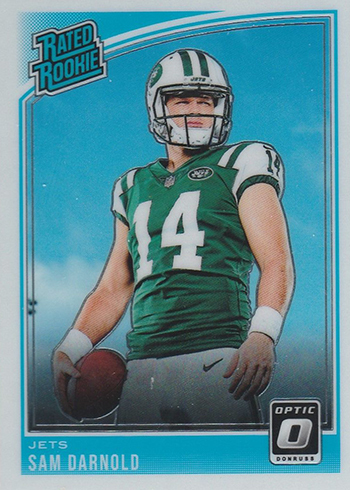 The 2018 Donruss Optic Football is a mix of veterans and rookies. 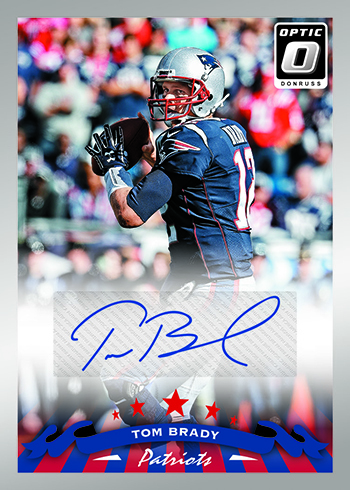 Vets take up 100 spots on the set’s checklist, meaning its focus is on NFL stars. 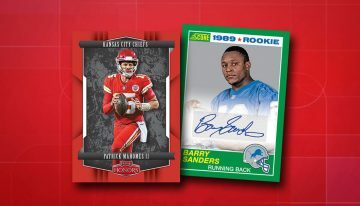 Rookies can be found both with regular rookies as well as in the Rated Rookie subset, a Donruss staple. 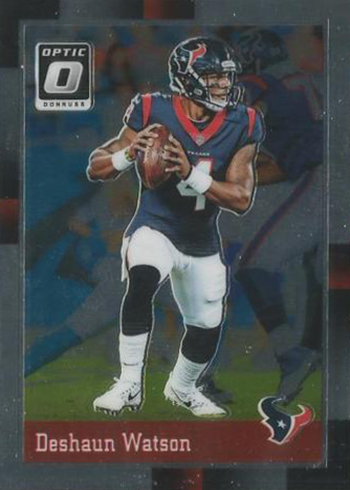 Parallels start out with Holo versions, which have a rainbow shimmer to them when shone in bright light. 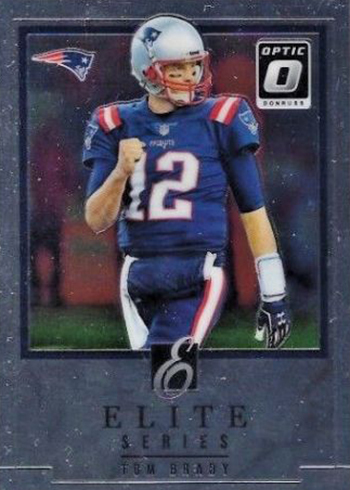 Holo veterans are 1:10 hobby packs while Rated Rookie Holos are 1:20. 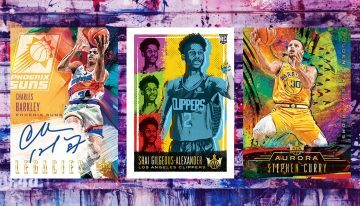 Holo colors available in hobby packs include Aqua (/299), Orange (/199), Blue (/149), Red (/99), Purple (/50), new Black Velocity (/25), Gold (/10), Green (/5) and Gold Vinyl (1/1). 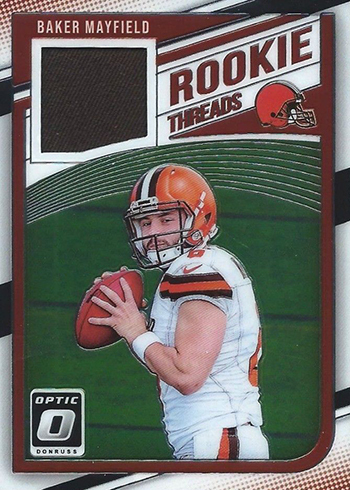 Additional parallels are exclusive to retail packs. 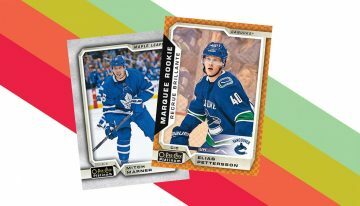 Blasters have Pink Rated Rookie and rookie cards. 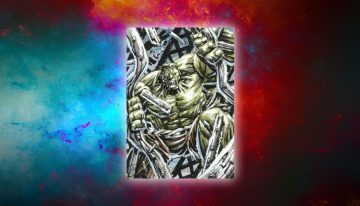 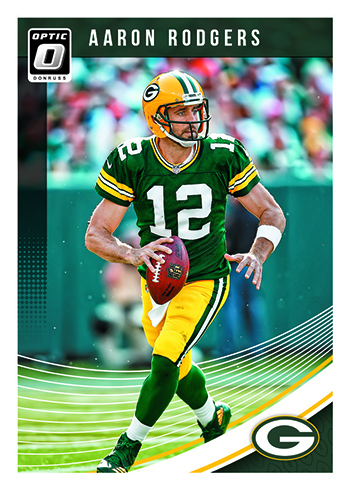 Green Velocity versions are only in fat packs while Teal Velocity cards are exclusive to retail gravity feed packs. 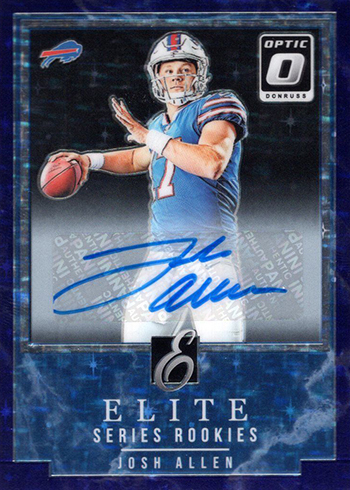 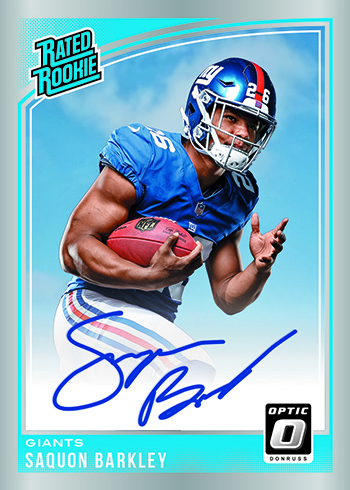 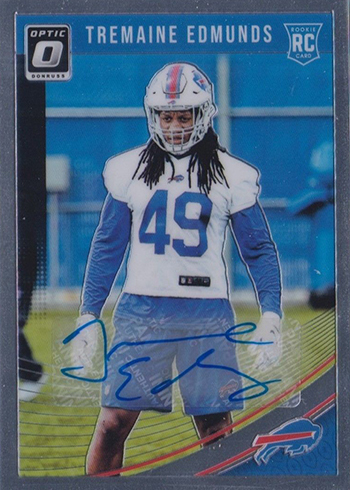 Rated Rookie Autographs are where collectors will find a lot of 2018 Donruss Optic Football’s signature content. 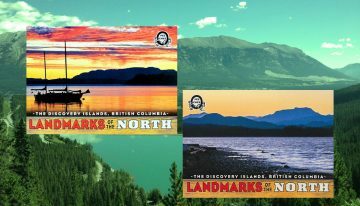 Base versions are numbered to 150 copies. 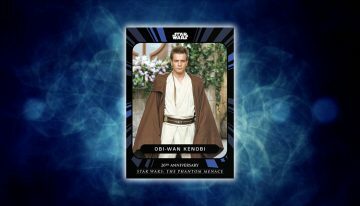 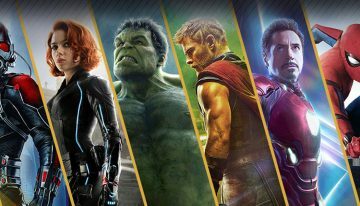 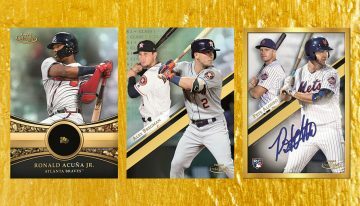 Parallels include Holo (/99), Blue (/75), Red (/50), Purple (/35), Black Velocity (/25), Gold (/10), Green (/5), and Gold Vinyl (1/1). 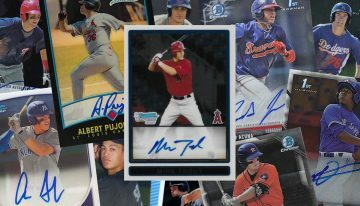 1988 and 1998 Tribute Autographs (both /25 or less) take things back 20 and 30 years to update some of Donruss’ past designs and bring them out of the vault. 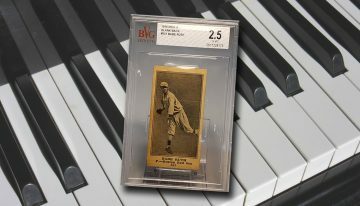 Both have one-of-one Gold Vinyl parallels. 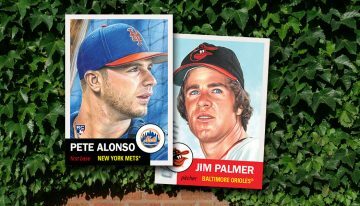 The two designs also have regular insert versions. 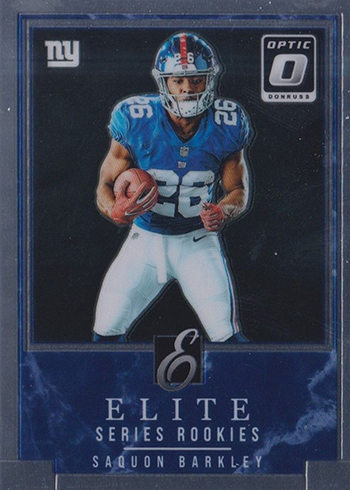 Rookie Elite Series Autographs (/25 or less) is another insert set with roots in an old Donruss design. 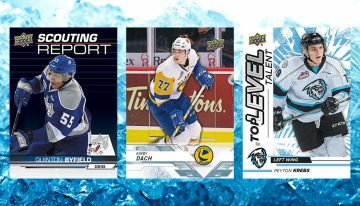 The checklist here is limited to key first-year players. 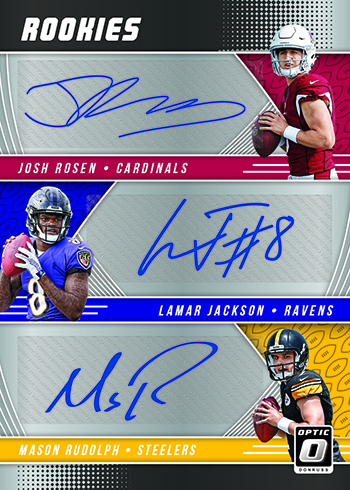 Rookie Dual Autographs and Rookie Triple Autographs are just that, highlighting multiple players on the same card. 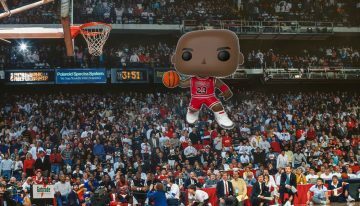 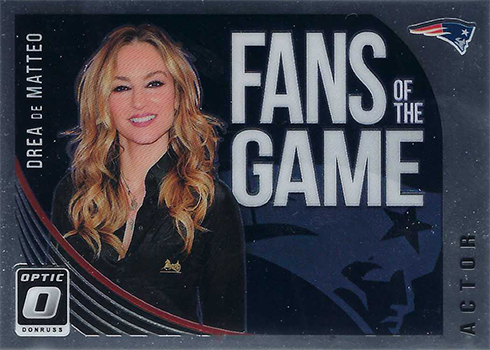 Fans of the Game Autographs return with signatures from actors and other celebrities, giving a bit of a pop culture spin to the release. 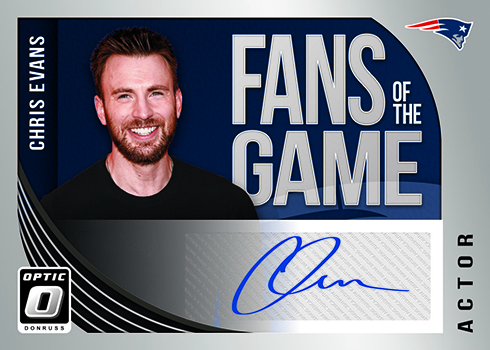 Chris Evans and Olympic gold medalist Chloe Kim are among the signers. 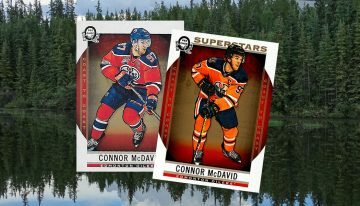 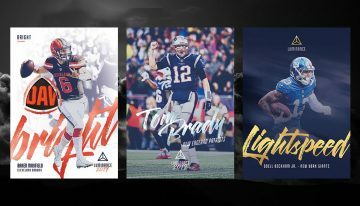 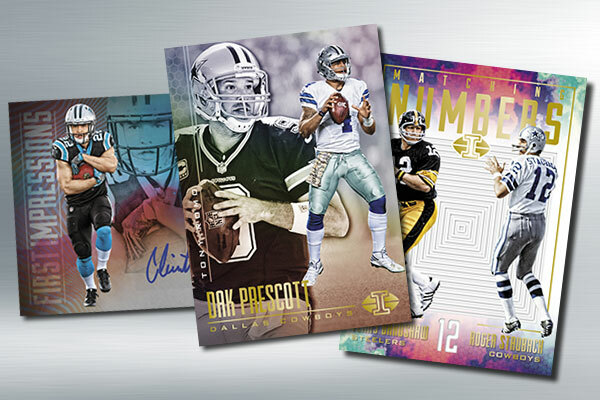 Memorabilia doesn’t play a major role in 2018 Donruss Optic Football, but there are a couple of places to find them. 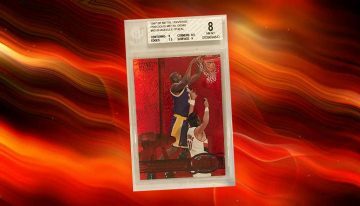 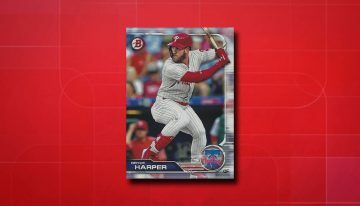 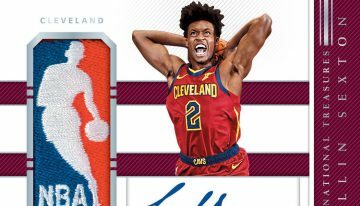 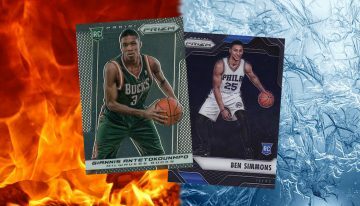 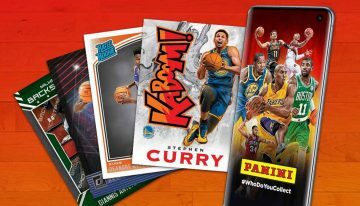 Phenoms Horizontal Prime Memorabilia are exclusive to blaster boxes. 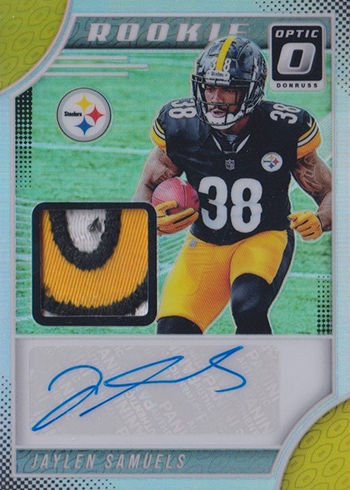 Hobby packs have Rookie Patch Autographs. 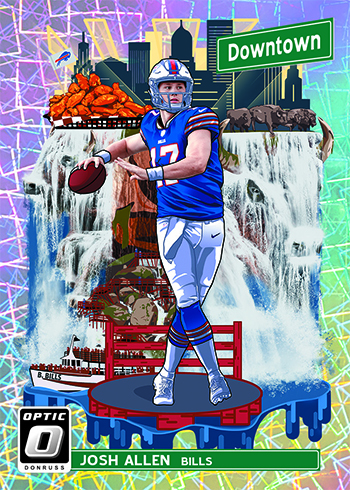 Downtown inserts, which mix photos and location-based illustrations, make the jump to Optic for the first time. 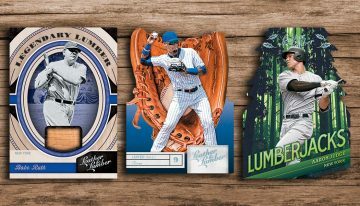 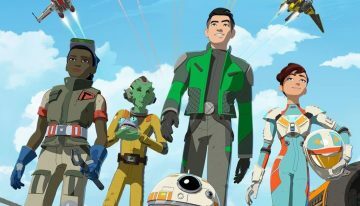 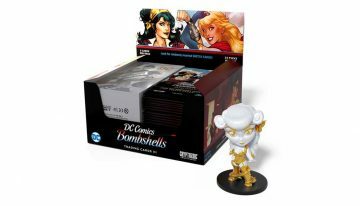 Base versions were originally announced as a case hit, but it appears they may be a little more common — but still on the tough side. 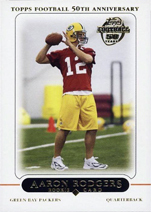 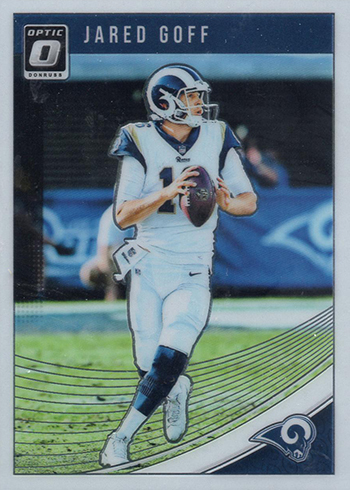 Gold Vinyl parallels are one-of-ones. 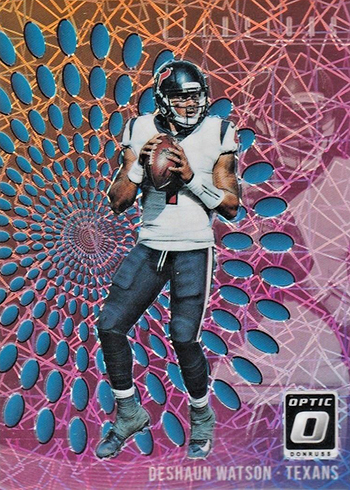 Thielen does not have a base version, only Gold Vinyl parallel. 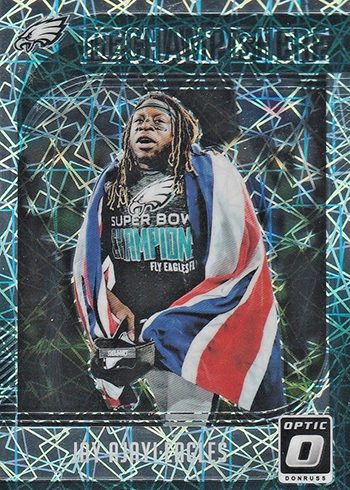 Wentz does not have a base version, only a Gold Vinyl parallel. 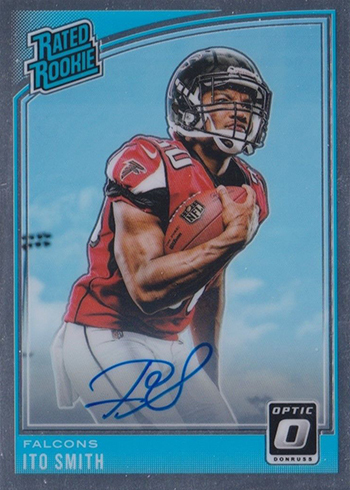 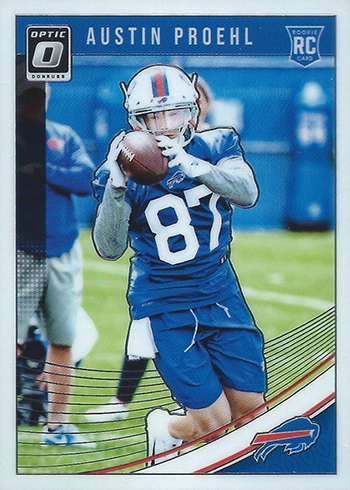 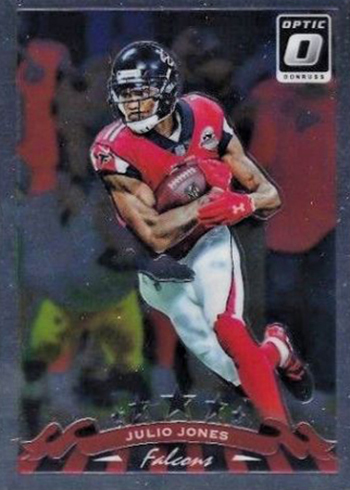 Want to know what cards your favorite team has in 2018 Donruss Optic Football? 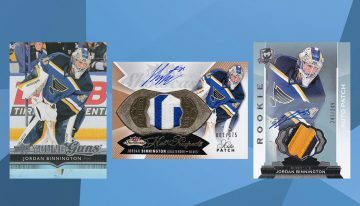 Here’s the checklist broken down by team. 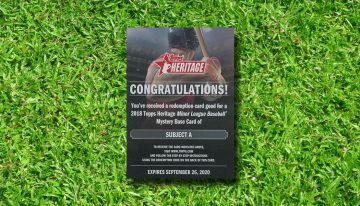 Scroll through or click below to go directly to that team.